Enjoy new energy at Turtle Rock. Dust control, redone restrooms, on-site store with beer & wine, new seasonal La Tortuga Mexican Bar & Grill. Same great location - walk to beach & ocean. More fun for families. Great specials! Cabins in a beach setting with decks & views. Each has a hot tub and barbecue. Some are pet friendly. There is a pet fee. Large cottage sleeps eight. We enjoyed our stay at this RV park. It was a very peaceful and relaxing place. It is a short walk to the beach. It was very windy on the beach, but we did enjoy walking along the beach. The staff was helpful and friendly. The restrooms were clean. The park was kept clean. Some of the sites have jacuzzis. We did see staff driving around each day to clean jacuzzis from sites where people had left. So it appears they keep those jacuzzis very clean as well. We love the proximity to the beach. We were evacuated from the RV Park where we planned to spend the summer due to forest fire. the management here at Turtle Rock was understanding and able to find a spot for us to stay. The office staff has been friendly and helpful the park is quiet and peaceful, clean, and pleasant. Great location, helpful staff. We had a hot tub site and it was CLEAN! Bathrooms were older but still working ok. Very nice stay! The beach is a short walk and plenty of agates for rockhounds. Loved the short walk to the beach! When we arrived we had a fair amount of water from a slide leak while driving. The lady at the counter asked if I needed a rug dryer. I was amazed and very thankful. They? had it delivered to our space. The customer service was fantastic our entire stay! Rain was my only problem but that was expected. Would definitely come back. Great place to come to spend time at the beach. It's only a couple hundred feet to walk to the beach. The spaces are fairly large and the staff is very friendly and helpful. We will be coming back! We stayed in a 45 ft. motorcoach with towed SUV. Gravel site was adequate. Very dusty park. Bathrooms/showers are reasonably clean but nothing special. This park is definitely not a Resort by my definition. Suitable for 1 or 2 nights. Sewer hookup requires an extension. Park is reasonably close to many Pacific Highway overlooks with spectacular views. 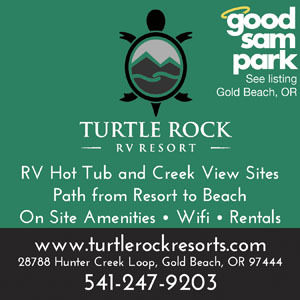 Park is now known as Turtle Rock Resort. We came here with our dog, and we took advantage of a winter special - 3 days for the price of 2, and thoroughly enjoyed our stay at back-in space 24. It was quite private, nestled under a sprawling tree, between two cottages and set against the hillside. It featured a raised deck, with a grill, picnic table and an extremely relaxing hot tub. The site was clean, albeit fairly empty, with only a handful of visitors, and several long term/permanent campers. It is dog-friendly, and the staff were always very amiable and efficient. The cable was standard fare, and the free WiFi worked well for us. Water pressure seemed to drop later in the day, but still good enough to shower and cook with. The 5 minute walk under the 101 to the empty beach really makes this place special. Of course it was January, and it was on-off raining, so for most of the time we did have the beach to ourselves :-) We had a great time searching for agates, exploring the rocks and dunes, chasing the dog, and dodging the rain squalls. We didn't use it, but we did check out the shower block, which was spotless, and also included an upstairs laundry unit, which came in very handy after getting drenched one morning by the sneaky incoming tide... We didn't experience any traffic noise from the 101 which passes close by the bottom of the campsite, perhaps those sites nearer would, although it is an elevated section of road and may not be a big problem. The brewery at the park entrance is excellent, and we did grab several growlers to enjoy later; we did not try the bar next door despite the staffs recommendations. Overall, a great little place and we have planned to return later this year. We actually extended our stay because we really like this park. The staff were very friendly and helpful. We were in the middle in a back in site without any trees. I can see how this would impact some. The other guests were very friendly, a community sort of feel. We used the laundry, but not restrooms much. I did go inside to see what they were like and was very impressed. Each one is private for taking a shower, no line of stalls. What makes this park is the location. We walked to the brewery and grill across the road for refreshments. The beach is a short walk away and you can walk all the way to the mouth of the river to the north for a good hike. They warned us that the winds can be a problem, they never were during our visit. This park is a rather large park along a river. That's a nice aspect although we didn't see anywhere to put a kayak/canoe in, which would have been a nice touch. The management was efficient and pleasant. We had a pull-thru site and it was easy to park and level. We were in the middle and didn't have a lot of privacy, but there are lots that seem to be more private. You'll want to ask for those when you book, if that's important. The park is very dog-friendly and didn't mind our 3 large dogs on site. We took the dogs on a walk through the park to get to the narrow path to the beach. Dogs are allowed on the beach, on a leash. If you have issues with mobility, this path is a bit tricky. Takes about 5-10 minutes to walk to over fairly uneven terrain. You can enjoy the beach by driving over to the turnout and getting out there. The beach is amazing, our favorite part of the location. Beachcombers will love the different rocks on the beach, in white, black, green, all colors. There are also some large rocks a few stories high at the beach. Bring your camera. We basically had the beach to ourselves. We didn't have the dust or odor issues others cited. The bathroom was clean and worked fine. The landscaping wasn't highly manicured, but simple and natural was okay with us. There is a brewery and bar right at the entrance. The bar has very good food. Not typical bar food. The burgers are very juicy and gourmet. The town of Gold Beach is just down the road. There are some dining and grocery shopping options. All in all, this was an adequate site. We found no issues with the site and if in the area again we would return. We were extremely disappointed. We were in a pull through in site 59. The campground was very dusty, every time a car, pickup or RV pulled through the campground, there was a dust cloud. Many of the RVs only stayed one night. The rest rooms were marginally clean, but had a very strong odor coming from the area. The odor often drifted to our camp site about 100 yards away. Had to keep the windows closed in the RV to keep the dust and smell out. Sites very close together, the next site sewer connection was a few away from our picnic table. The only positive item this campground has it that it is a short walk to the sandy beach. Definitely did not deserve the high ratings from Good Sam. Beat the crowds & save money & enjoy the Oregon coast from Jan thru April. Watch the winter waves, see the otters frolic & fish in our tidal creek. Go clamming and fishing, enjoy local brew pubs. Relax in a hot tub. Book now! 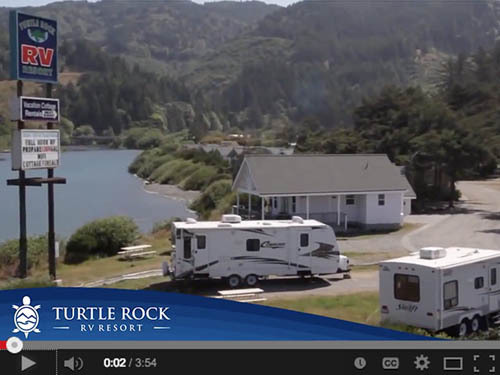 Make Turtle Rock Resort your south Oregon Coast home & you can do it all. 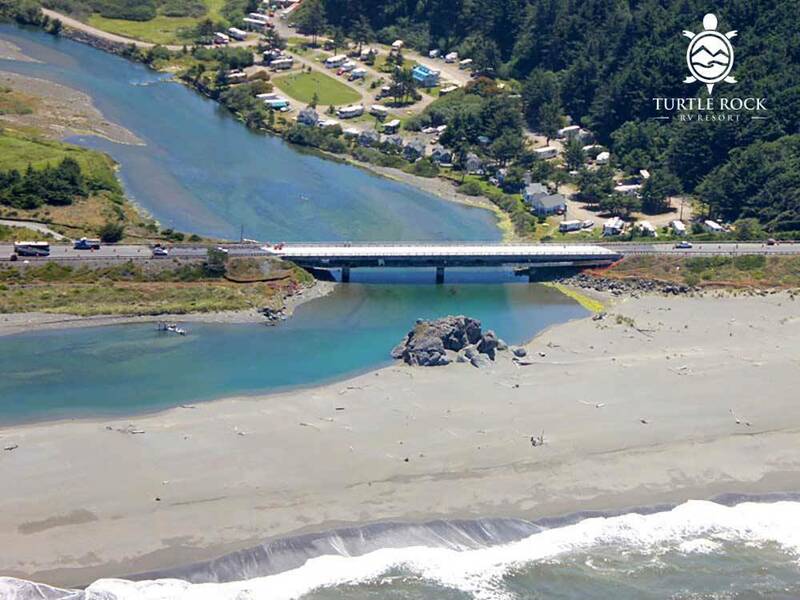 Walk our path to the beach, take a jet boat up the Rogue River or relax in a spacious site - some with hot tubs. Enjoy our new Mexican bar & grill.